Can you believe its been 3 years already? Time flies when you're having fun! Well technically its not my blogs anniversary until February 1st, but I thought we'd have a party to countdown to it. You're all invited and even better the presents are for you guys! 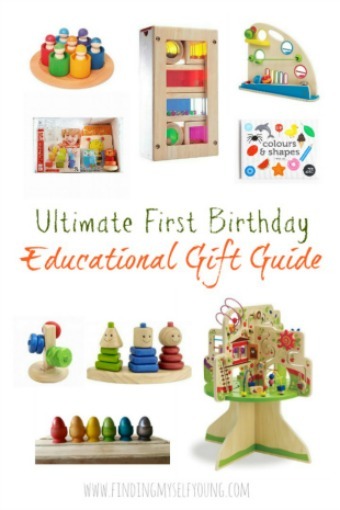 I have fifteen wonderful businesses involved who have put together a great selection of prizes for babies, kids and women so there's something for everyone (except maybe the handful of men who read my blog). So, will you join me to celebrate?! To be in the running to win a prize all you have to do is look through the prize list below, complete the rafflecopter prompts and let me know in a comment which prize you'd love to win and why. Its literally that simple! Name My Stuff specialise in personalising a range of babies and kids products. They permanently mark all items with either names or your own personal message so there's no need to use stickers or labels which can fall off or deteriorate over time. Name my Stuff sell an extensive range of dummy styles and colours, covering all teat shapes using high quality dummies similar to the leading brands available. The teats are available in silicone or latex. 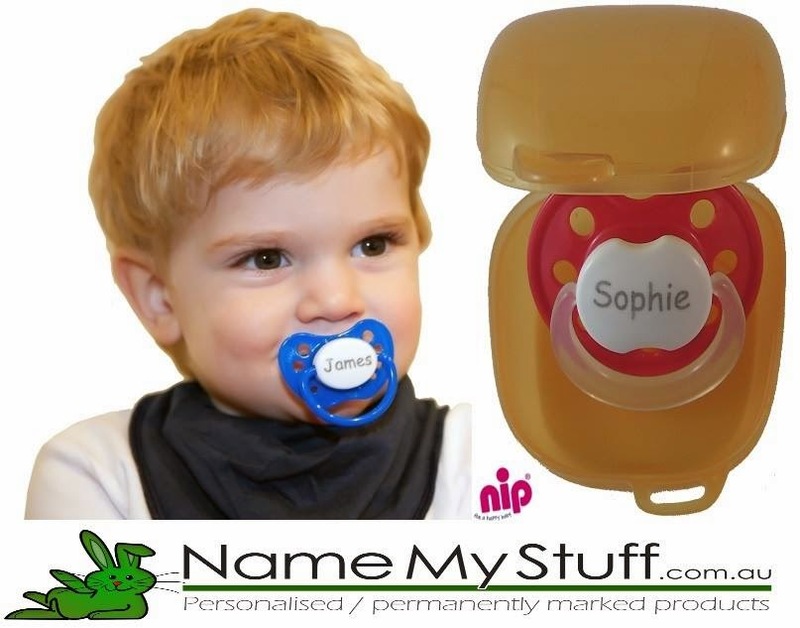 The business originally started selling only personalised dummies (and has since expanded to include other items including drinkware, lunchboxes, goggles, infobands and more). We have a number of their personalised dummies as well as personalised lunch boxes. They are offering one lucky reader a prize pack including 3 x personalised dummies, 1 Nip sterilising box and 1 BandanaBib. RRP $52.80. Winner to choose dummies. KidzAid Australia are a team of healthcare professionals including critical care nurses from Emergency Departments and paediatric nurses with a wealth of expertise and knowledge in dealing with sick children. 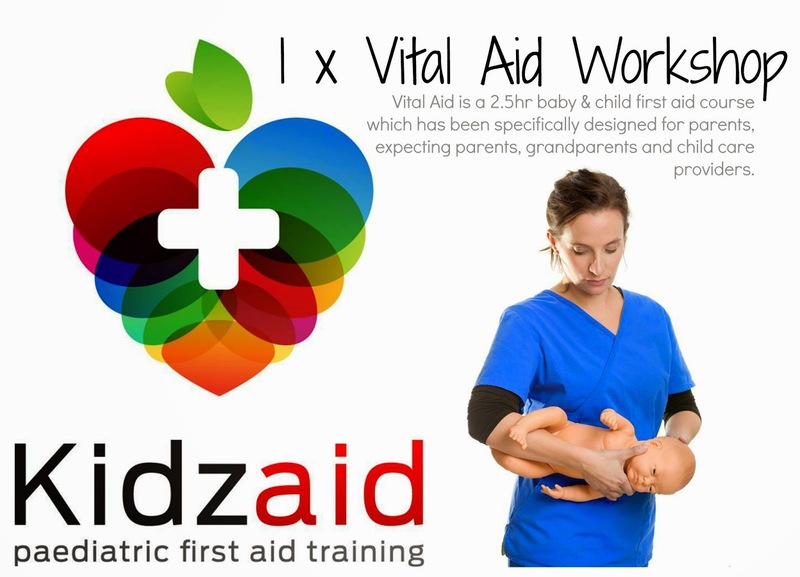 KidzAid training sessions provide participants with the knowledge and skills needed to be able to confidently recognise and manage a seriously ill or injured baby and child. They're offering one reader a vital aid workshop which is a 2.5hr baby and child first aid course specifically designed for parents and child care providers. Voucher is valid for 6 months from issue and is non transferable. RRP $79. Courses are currently available in NSW, VIC & ACT only. 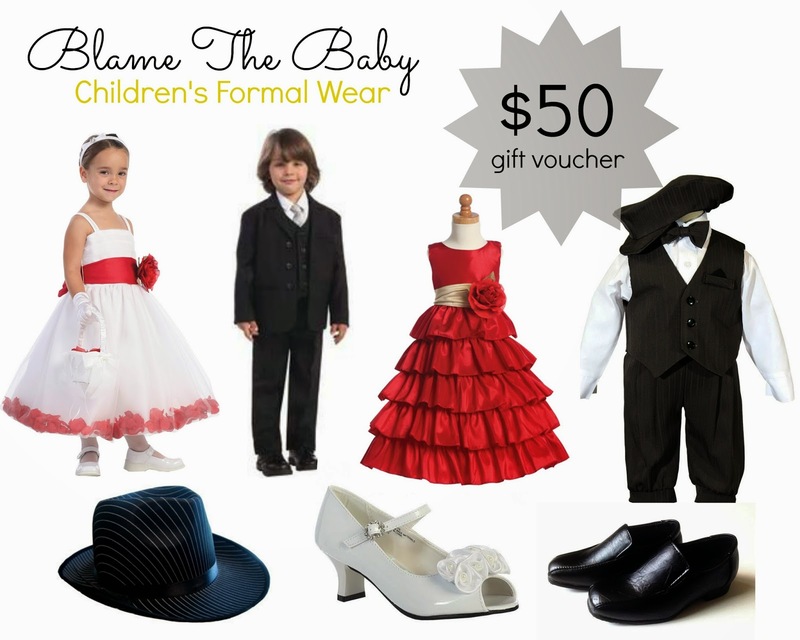 Blame the Baby specialise in children's formal wear for every occasion. They have a large range of boys suits in different colours and styles from size 000-14. They also have cute little baby tuxedos. For little girls there's a range of dresses including flower girl dresses, formal dresses and communion dresses from size 00-12. To complete the look they also stock a range of accessories including hats, ties, vests, belts, suspenders, dress shoes, bows and stockings. Blame the baby are offering one lucky reader a $50 voucher. To be used for any purchase online at www.blamethebaby.com.au. Valid until the date listed on the voucher only. Can be transferred to another name. Not to be used in conjunction with any other offer. Indie and Sloan make cool tee's for babies, boys and girls from newborn to 6 yrs old. Indie and Sloan tees are for kids with an adventurous spirit, those who like to stand out and explore and who aren't afraid to get dirty. All designs are original and are screen printed by hand using non-toxic water based ink. There are 9 prints currently available and more are added every few months. Bub has Ingrid the owl and the Princess and Warrior tees and I have a special adult Ingrid the Owl tee and we love them. 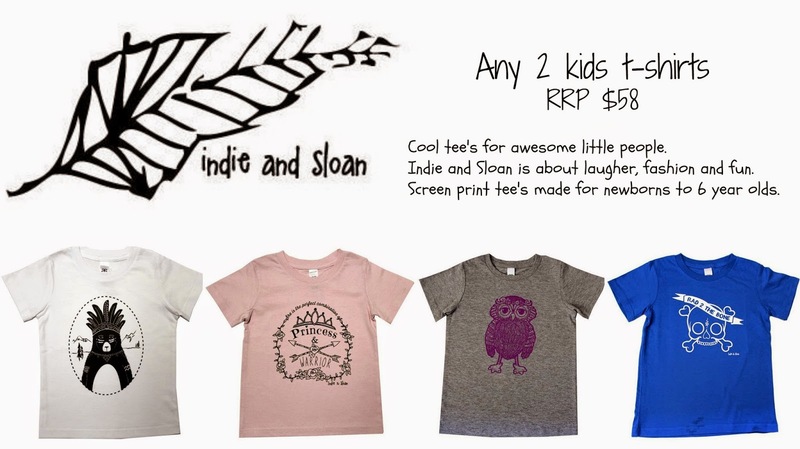 Indie and Sloan are offering one lucky reader 2 x kids tees. 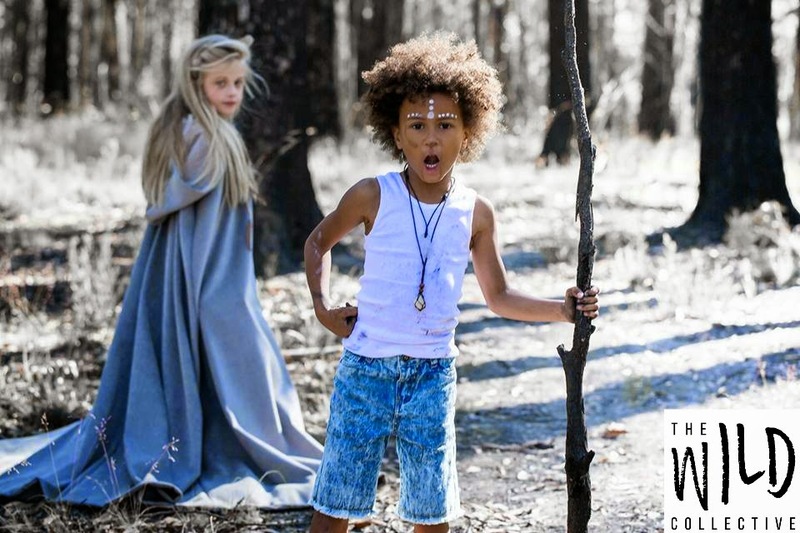 Winner to chose from kids styles available at conclusion of the promotion. Adult tees are not included. 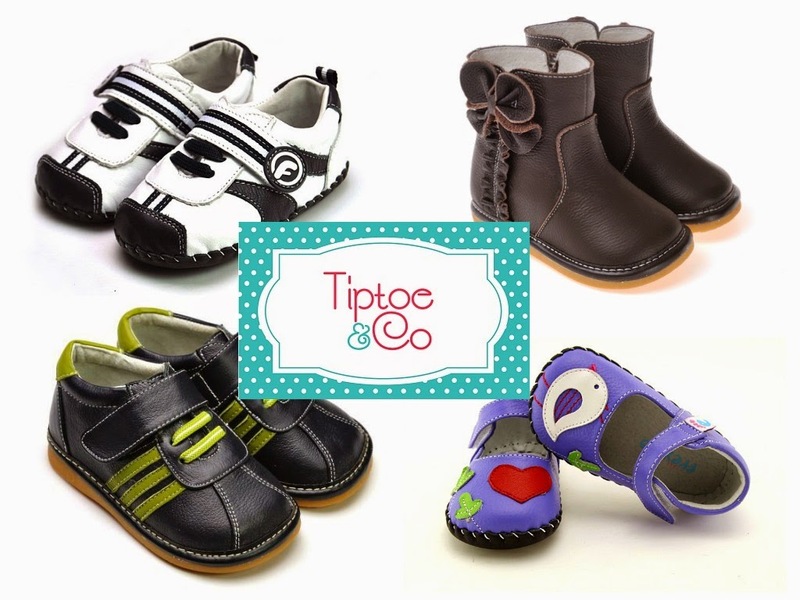 Tiptoe & Co is a children's shoe boutique that sells high quality shoes for both boys and girls at affordable prices. They hand pick quality leather shoes for babies, toddlers and older children and sell them below the RRP. Tiptoe & Co stock a large range of shoes from popular brands Caroch, Freycoo, Little Blue Lamb and Vans as well as Shoezooz kids shoe labels. They have a $40 voucher for one lucky reader. If you need help choosing which shoes to buy I'm happy to give you suggestions, we have 9 pairs we love them so much! Voucher can be used for any items in stock including sale items and postage. Voucher total ($40.00) must be used in one transaction. If the purchase total is less than the voucher, remaining voucher amount is void. Voucher may be transferred. Voucher valid until 30 June 2015. Luna Blu sell vintage inspired oil cloth bags and accessories. Their range includes beach bags, overnight bags, nappy bags and more. They are offering one lucky reader a Madison bag in the floral fusion print. The Madison bag is a family-sized carry-all tote and is perfect as a picnic bag, beach bag, or overnight bag. The durable oilcloth finish makes it easy to wipe clean making it perfect for mums with little ones. The Madison bag has a stud closure, adjustable side studs and a reinforced base. It's lined with matching canvas fabric, with an internal zipped pocket and one internal open pocket. Bag measures 45 x 33 x 17cm. RRP $80. 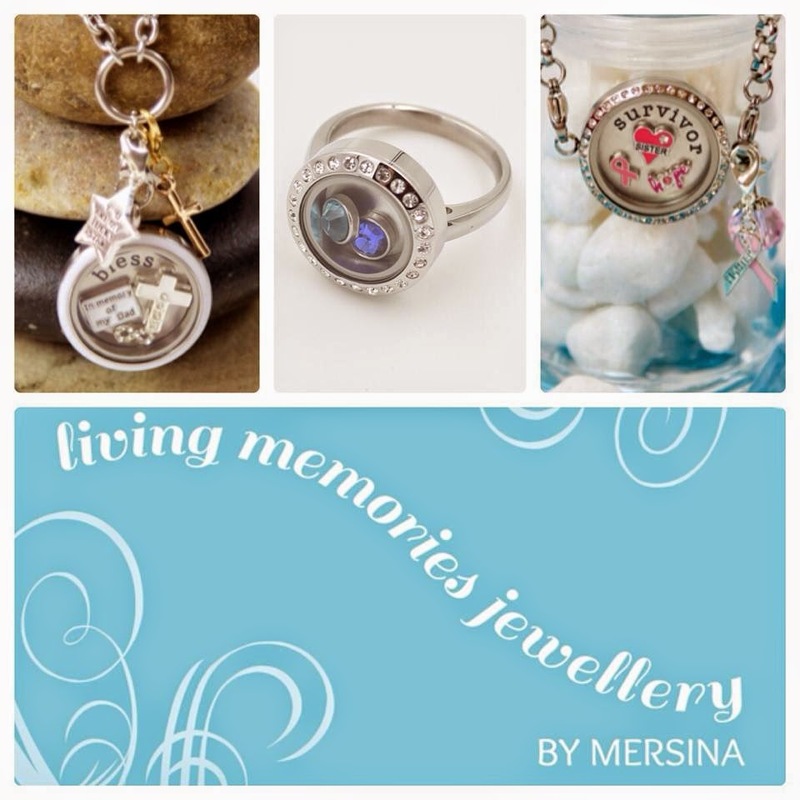 Living Memories Jewellery by Mersina create personalised pieces of jewellery to capture special moments in your life. The company is owned and operated by a stay at home mum who is passionate about creating the perfect piece of jewellery to capture your memories. She is offering one lucky reader a $50 gift voucher to create a living locket. Each locket is created individually with your choice of charms and embellishments to make it uniquely yours. Charms can be secured within the locket or free floating. Winner must pay $5 postage for delivery of locket. The Girls Only Festival (GO Festival) is an annual festival celebrating women. The GO Festival features a range of exhibitors, parades, speakers, demonstrations and zones exclusively for women. This years event is being held on the 13th, 14th and 15th of March at the Royal Exhibition Building, Carlton, Victoria. Friday the 13th is mums day out dedicated to all the busy mums (you can bring along pre-school aged kids). For a list of exhibitors who'll be at this years event click here. If you need to take a day out for yourself for some relaxation and pampering then why not get together a group of girlfriends and head out for a day of girls only fun. The GO Festival organisers have 4 x tickets up for grabs for one lucky reader. One winner will receive 4 tickets. Tickets can be used on winner's preferred festival date. Winner must be able to travel to Melbourne Victoria to attend the festival. RRP $60. Sarah Lauren is a craft supply store stocking Australia's largest selection of ribbon, beads, jewellery hardware, bows, embellishments and craft tools available online. New items are added to their range regularly and everything is available at wholesale prices so you always get great value for money. If you have the crafting bug then Sarah Lauren should be your first port of call for supplies. They have a $50 voucher for one lucky reader. Voucher expires 30 June 2015. 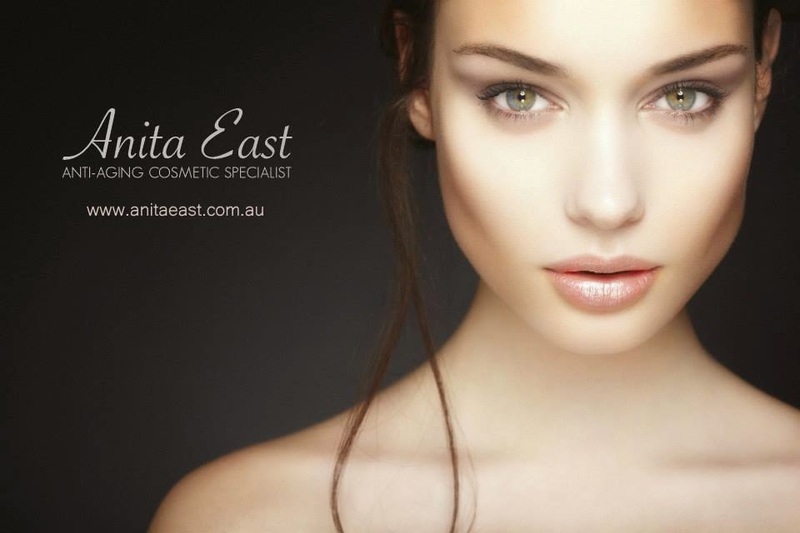 Anita East is an anti-aging cosmetic specialist who has performed in excess of 12,000 non surgical cosmetic facial enhancements for loyal clients throughout Australia. Anita East is synonymous with the highest quality of work, care and individual client focus. When we feel good about the way we look and the way we project ourselves to those around us, we are happier and more fulfilled. Anita East is offering a $50 gift voucher which can be used toward all treatments as well as a complimentary 45 minute full facial assessment valued at $100 for one lucky reader. Winner must be able to attend one of the Brisbane clinics to claim prize. The Wild Collective is a premier shopping event coming to Melbourne this August. Roam inspiring stalls from leading local and international designers, while on the prowl for the very best in eclectic and handmade fashion, beauty products, handcrafted furniture and home wares, toys, eco-friendly products, art and more. One lucky reader will get a $100 voucher to spend at the August event. Voucher is not redeemable for cash and must be spent in one day. Winner must be able to attend the event in Melbourne in order to claim voucher. So, now that you've read through all the amazing prizes, all that's left to do is follow the rafflecopter prompts below. Also, don't forget to let me know which prize you want to win and why in a comment below. * If you don't have any of the account options choose the name/url option and leave the url blank or choose the anonymous option (but remember to change it to your name instead of anonymous). Competition is open to Australian residents only, excluding ACT. All mandatory entry options must be completed in order to constitute a valid entry. Please ensure you read all the individual terms and conditions for each individual prize (written under photos) before choosing a prize. This competition is a game of skill and will be judged as such. All winners will be chosen by the respective businesses involved. Winners must make contact within 48hrs or prizes will be redrawn. Prizes will be distributed directly from the relevant business. Finding Myself Young takes no responsibility for the delivery of prizes. This competition is in no way associated with, administered or endorsed by Facebook. I would LOVE the LunaBlu bag please. Over the past year, I have made the positive change to be more active. This has resulted in us spending a lot more time outdoors enjoying days at the park, going on long walks, swimming at the beach, and more. This beautiful bag would be ideal for holding my family of five's things. Whether it's our beach towels and swimmers, or food for a picnic, or our cricket set, this bag would be perfect for us. Thanks so much for the chance to win, and congrats on a great milestone too! Happy bloggerversary - 3 years of sharing is an amazing achievement. Kick back and enjoy the accolades. Awesome prizes you've got here lovely! I think the one I would most like to win the first aid for kids course. I've been wanting to do one since before Punky was born but just haven't gotten a chance. With two small girls I would feel so much more confident if Dave and I actually knew what we were doing. A course like this probably would have saved me a massive scare and trip to the hospital when Zee chocked when she was 7 months old. Talk about a heart attack moment! I don't think I've ever been more scared in my life! I did a kids first aid course when Hayley was a few months old after her massive choking episode and hospital stay. It definitely helps to ease your nerves. Watching them not being able to breathe is THE SCARIEST THING EVER so I totally get what you were feeling. I have a 4 year old who is terrified of the dark and has trouble falling asleep and then wakes because of this fear. Unfortunately her brother and sister wake up and have trouble settling with all of the other night lights / lamps we have tried (a case of one awake or two!) Would love to win the owl night light from scandi baby please to help our daughter with this fear especially since her room happens to be owl themed! Meant to be I say! lol . And happy birthday! What a bonanza giveaway that is Toni! Congrats on your third anniversary! I'd totally love the anti-ageing treatment at Anita East. Well done on your third blog anniversary. What a mammoth giveaway. Will pop back and enter when I have more time. I think the Knot lace jewellery is my favourite. Awesome giveaway! I would love to win the Scandi Baby Owl Nightlight. Mr 5 has started to be scared of the dark and we have been using his lamp. The lamp is a bit bright though so I would love something that is a little less bright, and looks pretty! What a giveaway!! Happy anniversary to you. The lunablu bag looks pretty good to me. So convenient, big and pretty. Id take it everywhere…. I'm going to have to go with the Living Memories jewelry! What a great bunch of prizes you have! Congrats on the anniversary! Great selection of prizes there Toni - happy blogoversary!!!! Happy bloggerversary! I'd love to win Tiptoe & Co voucher for my girl who just starts to walk and needs a pair of comfy shoes. I would love to win the Luna Blu bag! It is super cute and looks like it would be a great size for an everyday bag. I am in love with the Luna Blu bag!! I need a new beach/swimming bag!! Tiptoe and co voucher as my little boys feet don't stop growing! Gorgeous cute shoes would sure stop any teary blues! My girls feet are growing at a tremendous rate and I can't keep shoes up to them. Our Miss 4 has jumped two sizes this summer alone and we constantly seem to be frequenting shoe shops. The Tiptoe & Co voucher would be so handy and reduce the pressure on the wallet for a bit at least. Happy 3rd Anniversary!! I would absolutely love the Indie & Sloan tee's they are extremely stylish yet practical helping my 2 little people to look cool but still be able to play and explore comfortably. Go you blogging three years well done great achievement. So many stories shared. I hope there are many more to come. I would love the knotlace necklace Due to curious chubby little hands all my other necklaces are already in knots. So a necklace that is supposed to be in a knot would be perfect for my collection :). They'll be adding QLD classes some time this year, but not in time for the giveaway unfortunately. 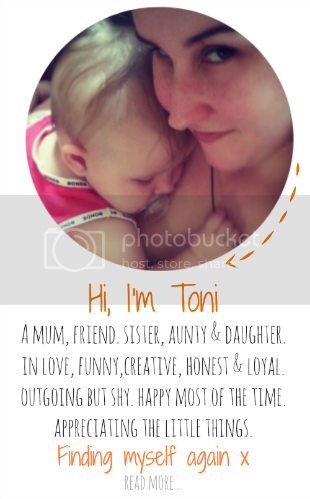 I would love to win the tiptoe & co voucher as my little girl will be walking very soon! i would love to win the owl nightlight as my daughter loves owls! The Anita East voucher. I really need some pampering as I've been so worn out these days. The owl light please, my niece loves having her light on and this would be soothing ! I'd love to create a living locket to store what is so special to me inside! The new baby pack as it's going to be perfect for my daughter Michelle as she has a 6 month old baby who has just started solid food. Love the Knotlace necklace to adorn my neck! I'd love the Greenbubz gift voucher - My most favourite friend ever is having her first baby this year, and I'd love to introduce her to some lovely organic and kid safe products. There is so much crap in the mainstream stores, and they have some lovely hampers on their site. 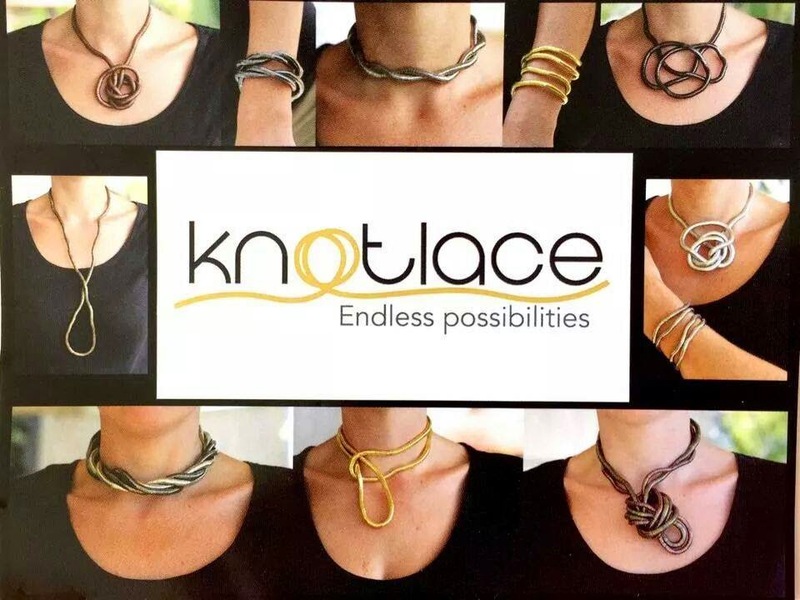 I'd love a Knotlace. It's such a versatile, stunning & unique accessory. Absolutely gorgeous! 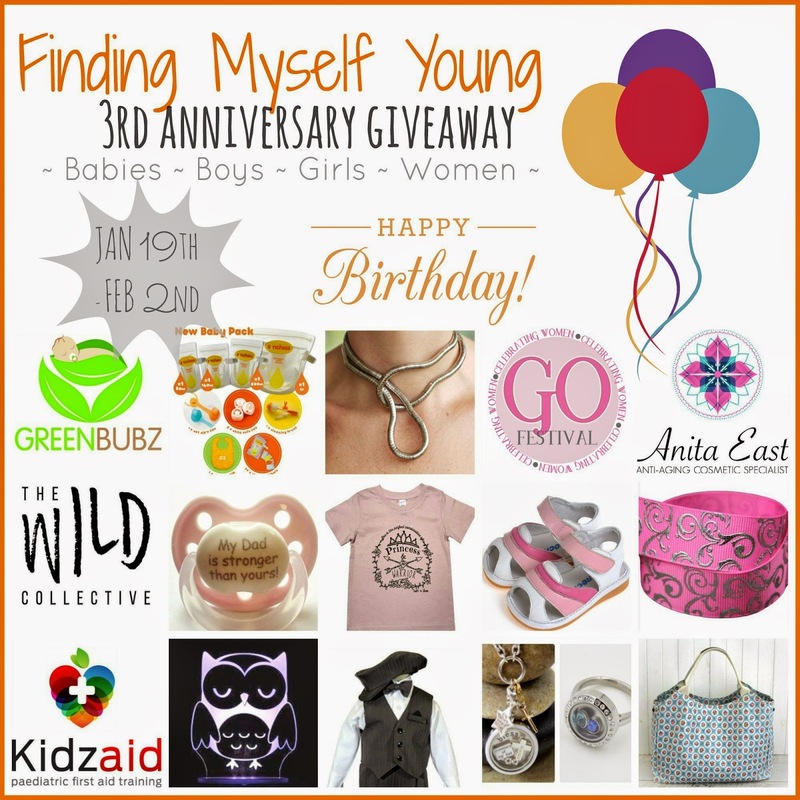 Happy 3rd Anniversary :D I love the GreenBubz Silicone Jewellery; that owl is so cute and my 8 month old would love it! Sinchies Starter Pack and GreenBubz for the grandbabies. Would love some shirts from Indie and Sloan for Master 5. As the second child he lives in hand me downs and although it doesn't bother him yet, I would love to give him something new, Thank you! But have finally decided on Tiptoe & Co shoes! A voucher towards shoes for them is my top pick! I would love to win the GreenBubz voucher because there are so many items I could purchase from this great page or the gorgeous Madison Bag. So many wonderful prizes to choose from! 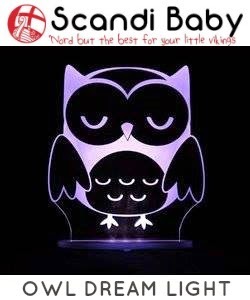 The SCAN BABY Owl Dream Light as liked by Charlie would be wonderful for my owl besotted littlies please. Scandi Baby Owl Nightlight. Love owls! Love it!! I would love to win the $50 voucher from Living Memories By Mersina! What a fantastic way to commemorate the birth of my second child in March! I would love to win the Anita East Ageing Costmestic prize - quite frankly, I turn 40 in April and don't look anything like I used to! LOL! The Scandibaby owl! My brother lives in Sweden and my eldest son loves him but hates the dark. This would be perfect! I toddle, I fall, I need new shoes! Tiptoe & Co is what I choose! I keep stealing my Mumma's shoes ........... well and my brother's .......... okay my sister's shoes too but they just don't fit and the smallest ones from the local shoes are terrible and fall off my feet! Tiptoe & Co, do you have my teeny tiny new shoes? GreenBubz promotes the kind of values and products my wonderful sister-in-law, Lauren, supports! 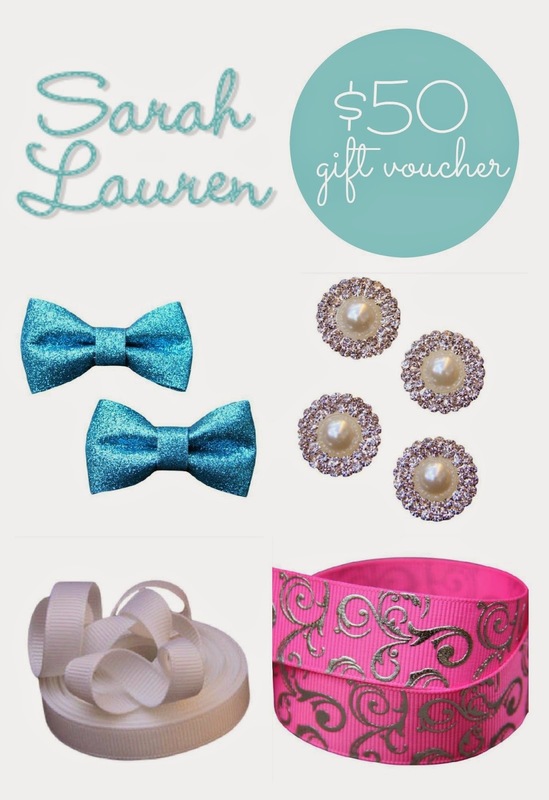 I'd love to win this voucher for her to buy my gorgeous niece something special AND eco-friendly! A perfect way to brighten the night! Would make my girl the bees knees! Luna Blu Madison Bag - so much nicer than the Ikea blue bag I'm dragging to swimming lessons at the moment! One for our new baby, toddler, and me! Great for the environment and finances of mine. And will be kept safe in Sinchies cold. I'll know what's in it and he'll have fun. And for me-what would be my pick? Mudslide pops would do the trick! Id love the GreenBubz voucher! I'd really love to win the owl night light by Scandi Baby for my three year old daughter Ruby. Her bedroom is at the end of the hall and has no windows so her room is pitch black at night. Lately she has become scared of the dark like most littlies; so this night light would be really great for her. Keep up the good work.! The Owl Dream Light would be very welcome in our house. Looks so pretty and great quality too. All the baby stuff sure does take its toll. Owning this bag sure would make me SMILE! Happy celebrations. So many wonderful prizes. The wild collective sounds interesting and a great way to find some wonderful new businesses to do some shopping at. With an older brother and sister, my boy and girl twinsies are rather tired of wearing hand me downs. They would love to rock a lovely new t-shirt each from Indie and Sloan! I would like the owl nightlight for my son. He gets a bit scared at night and this would be comforting. Loving the owl dreamlight, my daughter is obsessed with owls and giraffes at the moment! I would love to win The Wild Collective’s voucher because I have never been to anything like this before. Even though I live in country Victoria, I would happily travel to Melbourne to attend this event. My best friend (who lives in Melbourne) and I are both due to have a second child soon, so this would be the perfect opportunity for us to catch up and have an amazing day out together. I would love to win the original Knotlace + earrings set! When you look good, you feel good and this beautiful and unique set would achieve that perfectly! I love standing out from the crowd. It would be great to refresh and update my accessories collection. I would love a Tip Toe & Co voucher for toddler Ashley,loves his sandals mummy bought for xmas from Tip Toe & Co,gets excited when we mention shoes & would love more since he is growing so fast.I love the leather goes well in the Qld climate.